Karen graduated from the University of Alberta’s Physical Therapy program in 1998. Since graduation she has earned additional training in Acupuncture, Craniosacral Therapy, Matwork Pilates, Visceral Manipulation, Dry Needling (shoulder and lower extremity) and Reiki. 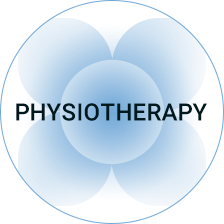 Karen finds these alternative techniques to be highly effective and has incorporated them to a large degree into her traditional physiotherapy practice. Karen comes to work each day with the intention of “helping people find peace in their bodies and joy in their lives”. She loves working one-on-one with clients and has a passion for helping those with long standing spinal issues and clients for whom traditional treatments have not fully resolved their symptoms. Through her “Healthy Spine Home Program” she helps clients learn safe and effective exercises to complement their chiropractic and massage therapy care. When not at work Karen enjoys spending time with the wonderful people in her life and simply enjoying each day. The elements that most represents me are air and water… creative, empathetic, and open to seeing the bigger picture. I am most in my element when… I am connected to something greater than myself, such as when I am meditating, moving to music, helping others feel better, or playing hockey.